Yes, the new “Clash of the Titans” movie comes out this weekend, and yes, I will go see it (but not in 3-D). But as good as this film could be, it cannot and will not replace the original 1981 version as one of the “classic” movies of my younger days. The story is an ancient tale of bravery, love, gods and monsters. Growing up, I remember watching the movies of Godzilla and Gamera and being bedazzled by the awesomeness of monsters coming to life on the screen. I also watched King Kong, Mighty Joe Young and the Sinbad movies just for that reason. I became familiar with the name Ray Harryhausen after watching “Jason and the Argonauts” and the animations of skeletons fighting the sailors. Even though I knew it wasn’t real, Harryhausen’s stop-motion model animation made it seem real. But it was in “Clash of the Titans” where his most memorable work was waiting for me. The skeletons returned to harass Perseus and his men as well as giant scorpions, a winged horse, mythical creatures, and, of course, the Kraken. The legend of the Kraken portrayed them as very large octopi or squid. Harryhausen went one step better and gave the monster a head that resembled a cross between a parrot and the Creature from the Black Lagoon. Even the funny and smart mechanical owl, Bubo, was made so well that I wanted to find an owl like that for myself. It wasn’t that these creations were done so masterfully that made the movie memorable. It was that there were so many throughout the entire film. A scene with one animated creature would end and another would begin with a brand new monster. As a teen boy who was reading Tolkien (for the billionth time) and playing “Dungeons and Dragons”, these were my imaginations coming to life. 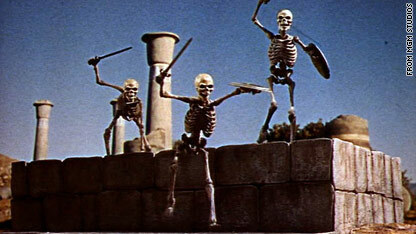 “Clash” would be Harryhausen’s last feature film to showcase his stop-action work. Computer animation was already being used and movie companies were using it more and more for their productions. While the use of computers made the creatures more life-like, they seemed to sap away my need for my imagination to make them seem real. While I have only seen trailers for the new version, I can say I am impressed with the new Kraken. I will go see the 2010 film and probably be dutifully entertained. Will I come away with the emotional and nostalgic feelings that I get when I watch the 1981 version? Probably not. But that doesn’t mean I won’t like it. What was your favorite part of the 1981 “Clash of the Titans”? What made it a memorable movie for you? Let us know in the comments area below. In the meantime, here's what moviegoers told iReporter Chris Morrow about the new version at an early screening. I'm Ron and not Ray...Ray died about ten years ago...but I am from an age, when movies really did scare you and not like the crakens and other things that get released in bedrooms around the world nowadays...LOL!!! Back in the early 80's though, this movie was not considered geekish, it was just considered plain awesome. Tim Pigott-Smith as Thallo is the reason =I= love that movie! My favorite part is the medusa scene when Perseus decapitates her and the body dumps out the thick caustic blood! I loved the 3 witches that had to share the one eye!!! Oh and Bubo of course! I too wanted a pet owl! I have the C.O.T.T.action figures mint on the card and i'm 41 years old. I saw the original a dozen times and every viewing was a treat! I always loved the charon, the devil's boatman. He was creepy for sure. I will most likely see the new version,but the original is a masterwork! Yes, the fighting skeletons are from 'Jason and the Argonauts', CNN! There are NO fighting skeletons in the 1981 'Clash'. And yeah, Bubo the mechanical owl was a result of the 'Kids love robots! We gotta include a robot!' post-'Star Wars' line of thinking. I was very frightened by the Medusa scene. Especially when she looked directly at the camera. I had to hide my face as I thought I was going to be turned to stone as well. I enjoyed the backround sounds and simple clever effects of the movie the most. The crashing of the waves, the slippery sounds of medusa in the quiet night, the arrows as they are released, using the sheild as a mirror, the oar as it passed through the River Styx, the wind through the trees, the sound of Pegasus flying, the sounds of walking through gravel, even the gates coming up to release the Krakan...it really contributed to taking you there. I have been a life-long Harryhausen fan, but I will go to see the new Clash. I will probably enjoy it for what it is, a high-tech remake of a classic film. I'm sure the whole project began because of the filmmakers love of the original, but will they capture the magic of the Harryhausen effects? I very much doubt it. A remake is easy to do, but recreating the magic that Ray Harryhausen brought to all of his films, that is a different matter. lay on the ground to get the perspectives right, slide rule in hand. That was old school at its best.